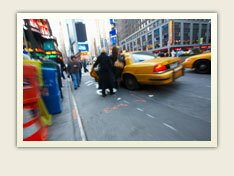 Pedestrian/vehicle related accidents are often associated with driver negligence. Even though a pedestrian accident might seem simple and straightforward, pedestrian accident trials are often full of legal complexities. The Paul Krueger Law Firm has the experience and knowledge to be your advocate in pedestrian accident trials. Injuries sustained in a pedestrian/vehicle accident are often quite serious and have significant financial consequences. We fight to insure that you receive the compensation you need to fully recover.